Compare Popular Acupressure Mats: Spoonk, Zensufu or Nayoya? Acupressure is an ancient healing art form that was developed in India and China. Though it was originally done using fingers to apply pressure into the body's reflex areas, nowadays, tools such as acupressure mats are also used to produce similar results. The applied pressure is supposed to improve blood circulation by triggering release of blocked energy, relieving muscle tension and pain, and revitalizing the body. In the process, the body releases endorphin hormones which induce a feeling of well being and happiness. As such, regular relaxation through acupressure is supposed to prevent stress buildup and the related diseases. Though universally accepted rigorous scientific proof that these benefits are indeed derived from acupressure is still to be provided, the very fact that acupressure has been practiced for centuries and adherents have resolutely claimed to have experienced the aforementioned benefits should be reason enough to take the practice for serious. The acupressure mat itself is a sort of acupuncture device that is made of a large foam rubber pad which is usually covered in cotton sacking, the surface of which is inlaid with tiny hard disks typically made of plastic containing protruding plastic spikes (see image right). The recommended way to use an acupressure mat is laying on it in bed and on your back for 30 to 40 minutes. You could also use it lying on your stomach or placing it on a sofa and sitting on it. According to users of these mats, 10 to 15 minute sessions is a good way to start, as it may take a while to get accustomed to the tiny spikes on the mat. However, because the longer you stay on the mat, the longer the benefits will stay with you, once you get used to the mat, you could lay on it for 30 to 40 minute sessions. When you start using an acupressure mat, you may experience some discomfort for the first few minutes. But after a few times of use, the initial discomfort usually disappears, and the pleasant, relaxing sensation remains. For best effects, the mat should be used with direct skin contact. A T-shirt can be worn if the sensation is too strong. As the stimulation points are somewhat sharp, the mat should be applied very slowly against the skin and sudden movements as well as rubbing the mat against the skin should be avoided to avoid any skin injuries. Finally, note that different people may respond differently to these mats, and even regular use by one person can result in different experiences depending on current personal and environmental conditions. People with high blood pressure or circulatory ailments should not use acupressure mats. Pregnant and breastfeeding women should not use acupressure mats. Children under 7 year should not be allowed to use acupressure mats. Older children should use the mat only under adult supervision. Epileptic people should not use acupressure mats. People with skin disorders should not use acupressure mats. Though acupressure massage may release the "happiness hormones", these mats do not represent a cure for depression or other medical conditions. Acupressure mats should not be used on areas with sores or wounds as the condition may worsen. Acupressure mats should be handled carefully and gently. Jumping onto them, or rubbing them against the skin may lead to injury. Daily use of an acupressure mat may help provide relaxation and pain relief, but remember that it is not a medical cure for any diseases, and that there are no medically proven claims regarding the benefits. A health care provider should be consulted before using these mats, and if any sort of negative impact to health is felt, utilization should stop right away and a health care provider contacted if necessary. This article will compare Spoonk, Zensufu and Nayoya acupressure mats. These were not just the most popular among Amazon customers at the time this article was written, but they have also received excellent reviews from most Amazon buyers (an average of 4.5 stars each out of 5 stars!). All three acupressure mats come with two main components: the main mat for the body and a smaller part for the head and neck. The main mat for for all three products measures 26" by 16". Note that the head part that comes with Zensufu and Nayoya mats is in the shape of a small pillow, while that of Spoonk is flat, about half the size of the main part, but can be rolled up for placing under the neck as shown in the picture on the right. All three products come with a carrying bag, but the Spoonk bag is the most stylish to carry around. 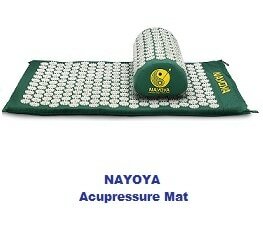 The Spoonk and Nayoya mats feature 6,210 acupressure points. The Zensufu mat product descriptions do not specify the exact amount of pressure points, but it is said to be in the thousands as well. Nayoya also specifies that the pillow has 1,782 acupressure points . The Zensufu and Nayoya mats are made of cotton. Spoonk makes two distinct lines of acupressure mats: The Cotton Line with mats made of cotton and the Eco-Line with mats made of 100% organic hemp and cotton blend (55% hemp and 45% cotton). The Eco-Line mats fabric is dyed with organic non-synthetic dyes. The Spoonk mat we recommend here is the one from Eco-Line. This is because hemp made mats are not just more eco-friendly, but also much more durable than mats made of cotton. Indeed, hemp fiber is one of the strongest and most durable of all of the natural textile fibers, and growing hemp does not require any fertilizers or pesticides. An additional benefit of hemp is that the porous nature of its fibers "breathe," allowing the fabric to be comfortable in both warm and cool weather. The porous nature of the fibers also help absorb odors. The mats of all three products are filled with rubber foam. The tiny disks and the pressure points (tiny spikes) of all three products are made of non-toxic ABS plastic. Because the benefits observed from acupressure mats may vary from one person to the next depending on personal physical and environmental conditions present at the time of use, we will summarize here the benefits claimed by the manufacturers of these products. But as mentioned earlier all three acupressure mats have received an average rating of 4.5 (out of 5) from Amazon customers who have used them, meaning that the results obtained meet in most cases the manufacturer's claims. Stimulates blood circulation, deep relaxation and tension relief for the neck, shoulders and back. Improves blood circulation, and increase in energy levels. Promotes deeper sense of relaxation and controls anxiety. Releases muscle tension and reduces back, neck, joint and hip pain. Aids digestion and promotes better sleep. Increases blood flow to knots and sore muscles in your back, helping to reduce inflammation and pain while releasing endorphins that interact with receptors to reduce pain, anxiety and stress while providing a sense of calm, relaxed, euphoric pleasure. The unique contoured pillow with its 1,782 acupressure points that can reach in between the neck and shoulder, treating tension headaches and neck muscle pain at the source. ​ The small travel-friendly neck pillow helps combat headache and neck pain also when you’re in the car, on a plane, or lying down in bed.